BI Platform supports a new application “Theme Designer” for customizing and Branding the view of Fiori BI LaunchPad. It helps to differentiate the application by applying unique corporate branding. 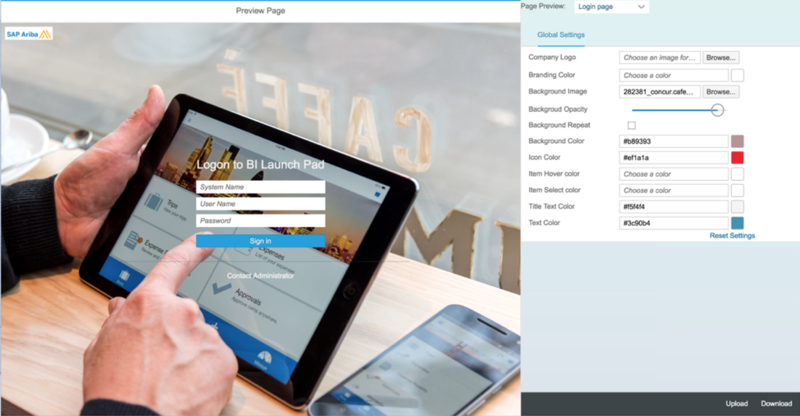 It lets Users personalize the appearance of the Fiori BI Launch pad by applying their company logo and background colors, and modifying other elements of the user interface. Introduced Theme Designer.war file in the collaterals folder for Fiori launchpad customization. This has to be deployed on the supported app server. Copy the ThemeDesigner.war file from the BusinessObjects Enterprise Installation Package:Collaterals\themeDesigner\ folder and deploy into the respective web application server. Note: Only Tomcat and Jboss web application servers are supported for ThemeDesigner.war file deployment. As an administrator you can use Theme Designer to create a new theme or to customize the existing view of the Fiori BI Launch pad. You can create a custom theme for the Login Page, My Home-Tile View, and My Home-List View. After the ThemeDesigner.war file deployment is successful. Launch the Theme Designer application by accessing http://(Host Name):(HTTP Port)/ThemeDesigner. The Theme Designer editor page appears, with a Global Settings pane to customize the Fiori BI Launch pad and a Preview pane. Company Logo– You can choose an image to change the company logo. Background Image– You can choose a background image to customize the background of the Fiori BI Launch pad. Note: You can choose an image, of filetype .png, from your local computer. The image should be less than 2MB. An error message is displayed if the file size is too large. Background Opacity– You can customize the brightness of the selected background image. You can set the opacity in the slider between 0 (minimum) to 1 (maximum). Background Repeat– You can enable this option to zoom in and repeat the background image. Note : Upload the image of size 512*308 pixels for better performance of the Background Repeat functionality. Background Color– You can select the desired shade of colors from the color palette to customize your background color. Icon Color– You can choose a color from the color palette to customize the color of the icon. Item Hover Color– You can choose the color that appears for the icon when you hover on it. Item Select Color– You can choose the color that appears for the icon when you select it. Title Text Color– You can customize the color of a UI text in the Header panel and Tool Bar of the Fiori BI Launchpad. Text Color– You can customize the text of the other UI texts in the Fiori BI Launch pad. Note: The Details Drawer of the Home page in list view always remains in the default theme. You can observe the reflected changes simultaneously in Preview pane beside the Global Settings pane. The custom-css.zip file is downloaded to your local computer, containing the company logo, background image, and theme.css. You can apply a custom theme created in Theme Designer to the Fiori BI Launch pad. Go to <INSTALLDIR> \SAP BusinessObjects XI 4.0\warfiles\webapps\BOE\WEB-INF\config\custom\and create a propertiesfile. In the properties file, add the CSS rule theme.enable=custom to apply a custom theme to the FIori BI Launch pad. Use WDeploy to redeploy the WAR file on the Web Application Server. For information on using WDeploy, see the SAP BusinessObjects Business Intelligence Platform Web Application Deployment Guide. Log on to the Fiori BI Launchpad to see the custom theme. Make a backup of the extracted custom-css file before the BOE upgrade. After the upgrade, perform all the steps mentioned above to apply the custom theme to Fiori BI Launchpad. Go to <INSTALLDIR> \SAP BusinessObjects XI 4.0\warfiles\webapps\BOE\WEB-INF\config\custom\and create a FioriBI.properties file. If you customize the URL to access the Fiori BI Launch pad, the administrator must perform the following steps to change the folder and category link. Log on to the Central Management Console(CMC) and select Applications–>BI launch pad Processing settings. http://(HOSTNAME):(WEB_APPLICATION_SERVER_PORT)/BOE/myBI?startFolder=%SI_CUID%, where myBI is the custom name used in app.url.name property.